Birthday freebies are prolific in the Phoenix AZ metro area. This one from Valle Luna is good for a free entree with a 14 day window to enjoy it. What’s better than going out to dinner for your birthday? Going out to dinner and having your meal for free. Yes, that’s right, eating at a restaurant on your birthday without having to pay the bill. Over a hundred restaurants in the Phoenix AZ area will gift you a free birthday meal, dessert, snack or drink. Most deals are valid anytime during your birthday week or even your entire birth month. So, with a little bit of planning, you can eat out for a month for free. Each restaurant’s rules are somewhat different. You’ll find most require advance registration to an email list to receive a coupon in time for your birthday. In addition to the area restaurants listed below, all of the national chain restaurants featured in our list of top 10 free birthday meals have a strong presence in the Valley. There you’ll find birthday freebie favorites that include Applebees, Golden Corral and Starbucks. We also have a comprehensive list of over 100 Phoenix free birthday meal deals. The following birthday deals have been hand-picked by our editorial staff. All are local Phoenix restaurants or restaurant companies with regional presence. These birthday jewels are either totally free-no strings-attached, bogo or offer a generous gift certificate toward total tab. Benihana. Sign up for Benihana’s Chef’s Table email newsletter and get a $30 gift certificate, valid for your entire birthday month. To use the certificate, your dinner party must purchase one entree. The certificate will be applied to additional items. Benihana, America’s favorite Japanese steakhouse, has locations in Chandler and Scottsdale. Gift certificates like this one from Buca di Beppo are sent for your birthday by restaurant email lists. Buca has one of the more generous free birthday meal deals. Hard Rock Cafe. Another chain restaurant with a “rockin'” birthday offer is the Hard Rock Cafe. Sign up for the Hard Rock Rewards program and you’ll get a free entree during your birthday month when you purchase another entree. That means you can try things like their famous fajitas, a cowboy ribeye steak or a fried shrimp platter for free. The Hard Rock Cafe is located in Collier Center in downtown Phoenix, just steps away from Chase Field. 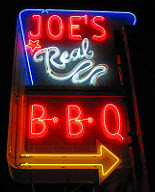 Joe’s Real BBQ, Joe’s Farm Grill and Liberty Market. These three Gilbert eateries, owned by Joe & Cindy Johnston, give patrons a generous birthday offer AND, unlike the other restaurants on this list, you don’t even have to sign up in advance. At Joe’s Real BBQ and Joe’s Farm Grill,you’ll get a flat $10 off of your dine-in or carry-out meal on the day of your birthday. At Liberty Market, you’ll get a $10 credit on your dine-in meal or a free dessert if you choose carry-out. To qualify, all you have to do is present your ID. All three restaurants feature fresh, locally-sourced cuisine with specials that change weekly. Twin Peaks. Get a free birthday entree at Twin Peaks, in Phoenix and Scottsdale, with no additional purchase required, when you sign up for the restaurant’s Friends of the Peaks email list. The offer is good between seven days prior to your birthday and seven days after your birthday. (Plus, just for signing up, you’ll get a coupon for a free order of chips and queso, good for 14 days.) Twin Peaks is a mountain lodge getaway theme, known for its made-from-scratch comfort foods. 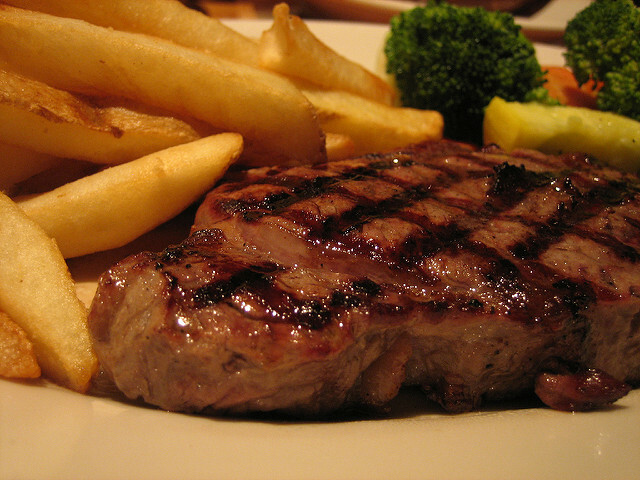 Enjoy menu favorites that include Mom’s pot roast, spicy chipotle chicken and a variety of grilled burgers. Draft beer served at a teeth-chattering 29 degrees and sports shown on high-def flat screens round out your birthday party here. Valle Luna. Valle Luna gives you an impossible choice for your birthday. Do you want a free entree or a free order of fried ice cream? 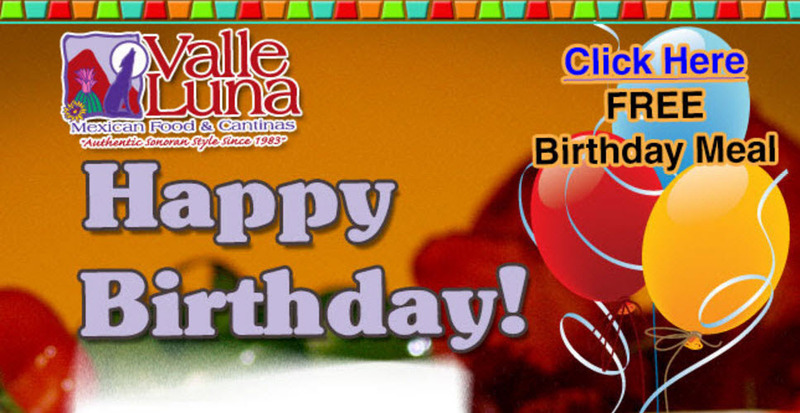 All you have to do to take advantage of this birthday offer is to sign up in advance for their Valle Luna Club. The offer is good when you purchase a beverage and is valid between seven days prior to your birthday and seven days after your birthday. (Plus, you’ll get a coupon for a BOGO entree when you purchase two beverages within 14 days of signing up for the club.) Voted as having the best Mexican food in Phoenix by the “New Times,” Valle Luna features an array of traditional and non-traditional Mexican favorites. They are particularly known for their make-your-own Luna burrito bowl, where you can pick ingredients from shrimp to steak to cheese to guacamole. Northwest Valley, Southeast Valley, Paradise Valley. Find the Valle Luna nearest you. Zoe’s Kitchen. Zoe’s Kitchen (5 locations) also offers a free entree for those celebrating a birthday. To qualify, you need to sign up for the restaurant’s email list. The offer is good between seven days prior and 14 days after your birthday when you purchase a second entree. (Plus, you get a coupon for a free 1/2 pint of chicken salad when you sign up for the email list to use within 14 days.) The food here is Mediterranean-inspired and includes items like chicken, steak and shrimp kabobs and Greek chicken marinara.